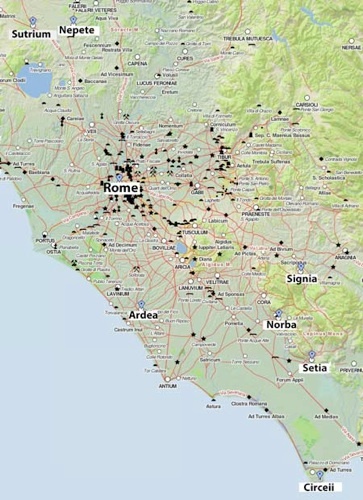 From the time of the Roman victory in the Latin War in 338 BC, the Romans founded a number of strategically-placed colonies in peninsular Italy, at which the colonists had Latin rights: that is, they had most of the benefits of Roman citizenship but, crucially, not the right to vote. Furthermore, like Rome’s Italian allies, they were obliged to provide soldiers for the Roman army at times of war. Obviously, this obligation became more onerous as Rome’s wars became more common and more prolonged. Matters came to a head during the Hannibalic War (218-201 BC), with the fortunate side-effect that Livy’s account of these events provides us with a complete list of the Latin colonies that existed at this time. “... transfer of soldiers to Sicily, most of whom were of Latin status or allies, was the cause of [complaints from them] ... that, for now the 10th year, they had been exhausted by levies of troops and their pay; [and] that almost every year they fought in a disastrous defeat. ... There were at that time 30 [Latin] colonies, (‘Roman History’, 27: 9 - 27:10). Aesernia; Ariminum; Beneventum; Brundisium; Cosa; Cremona; Firmum; Fregellae; Hadria; Luceria; Norba; Paestum; Pontiae; Placentia; Saticula; Signia; Spoletium; and Venusia. These 30 colonies can be usefully discussed in groups, defined chronologically.